Board game development is a very individual process. Every single developer has different methods for creating their games. This article is the eleventh of a 19-part suite on board game design and development. Accessibility is a big issue in board gaming. It’s also a very complex issue that is hard to talk about succinctly because it covers game design, product testing, individual behavior, and group behavior under a lot of different circumstances. To help understand this subject, I’ve brought in Dr. Michael Heron of Meeple Like Us. This our second accessibility article. I recommend you read the first one here. Colorblindness results from Century Spice Road. (Photo from Meeple Like Us). Accessible games are ones where people can still play your game even if they have extraordinary usability needs. An inaccessibility is any feature of a game that presents a barrier to enjoyment. Mostly it’s about how information is presented and how the game is manipulated, but I also include aspects of cultural inaccessibility and representation. Below is a transcript of our conversation over Discord DMs. It has been lightly edited for clarity and flow. Brandon: Let’s talk about cognitive and communicative accessibility. What are some ways in which games often fail to be cognitively accessible? Brandon: For clarity: referring to both fluid intelligence and memory here. Michael: This is one of the hardest categories for a modern designer game to do well within – the more strategically and tactically interesting a game is, the harder it is for it to be delivered as a cognitively accessible experience. Even saying that, though, there are particular things that are especially troublesome – heavy amounts of synergy, mutable game flow, numeracy and complex literacy needs, heavy use of probability, inconsistent terminologies and complex conditionals in rules (if this then than except… sort of thing). Michael: Memory suffers when playing well is dependent on knowing hidden game state – cards in a deck builder or such. There are also games that rely on elements of general knowledge or trivia, or have actions that have counteractions that can be counteracted. That means it’s hard enough remembering what you’re doing now before you even think about rolling back the overall stack of actions to where you started. Michael: There are some nice ways to help resolve these problems though – one of my favourites is when games have a “simple” version of a game and you can layer in additional complexity with built-in rules and systems. It’s best if it’s refereed to as something other than “simple” though because there’s a kind of stigma that attaches to terms like that. I like it when games offer a visual cue as to probability (like Catan’s number tiles), and when arithmetic operations come with physical tokens that you can manipulate instead of doing straight up arithmetic. Memory is best supported by just making sure that every part of the game state has some kind of physical token to represent it. 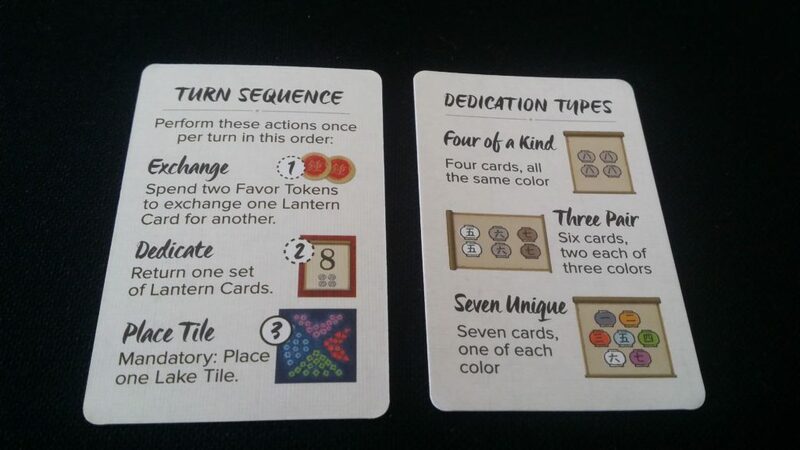 Lanterns includes reference cards that serve as memory aids. (Photo from Meeple Like Us). Michael: Some games involve layering in complexity within stacks, or have game systems that obscure the visibility of other game elements. I’m currently playing the Game of Thrones card game which does that a lot – you “attach” cards to other cards and in the process you end up hiding game state while at the same time you’re making it more complex. Avoiding that is a good technique, even if it’s somewhat situationally dependent on the game’s overall design. 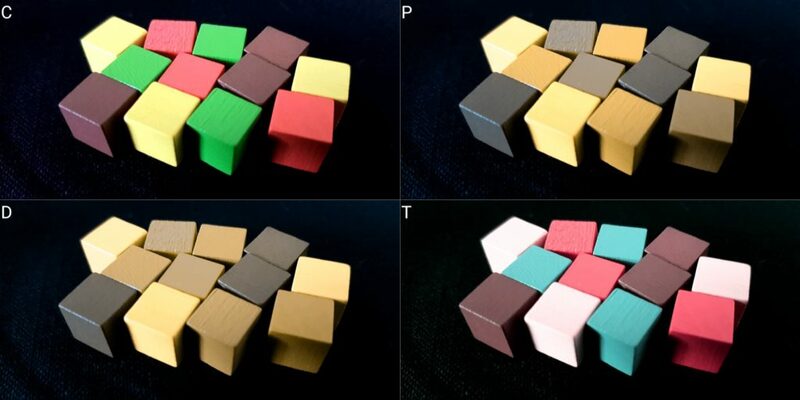 Michael: One of the more useful observations here is that while complex games are likely to be cognitively inaccessible, it’s not necessarily the case that simple games are cognitively accessible. It’s more about the game state and how that game state is manipulated. Once Upon a Time for example is a very simple game that is very cognitively expensive because it’s about building stories, holding them in mind and locating points of narrative leverage where you can intercede. Brandon: My absolute favorite way to deal with cognitive accessibility is also possibly the hardest: making a game that can be enjoyed on many levels. Very superficial and straightforward strategies, though not necessarily optimal, should still be able to win or – at the very least – really fun to play. Brandon: This is a personal design philosophy of mine. Michael: Randomness can be a great leveler in this category too. Keeps games from becoming solved games. Makes simple strategies viable while still letting people play 12 dimensional chess if they want to. Makes emotional aspects easier as well. Less despair / foregone conclusion issues and so on. Brandon: What are some ways in which games fail to achieve communicative accessibility? Michael: Mostly this is an area where games do quite well – there are few games where there’s a real need for communication beyond the level of table talk. There are, though, a family of social games that stress communication, usually within tight constraints or complex scenarios, where there are going to be problems. Michael: For one thing, articulation difficulties can make it difficult to make an argument using odd, game specific terminology or jargon. If you’re doing that to a time limit, it’s even harder. If you’re doing it when other people are trying to talk over you, it’s harder still. And if you’re doing all of that when other people around the table are trying to make you look like a liar (games like Resistance as an example), you’ve got a recipe for profound inaccessibility. Michael: Similarly with hearing difficulties – if your ability to play the game depends on picking up on conversational nuance or the like it’s going to be a problem. Some games make use of audio signals to indicate things should happen too – Escape: Curse of the Temple, for example, has a gong that rings to indicate that players should scurry on back to the central cavern. Many of these games offer alternatives, like hourglasses, but while those work they change the game around them – you need to keep checking the time yourself instead of being notified when it’s time to do something. 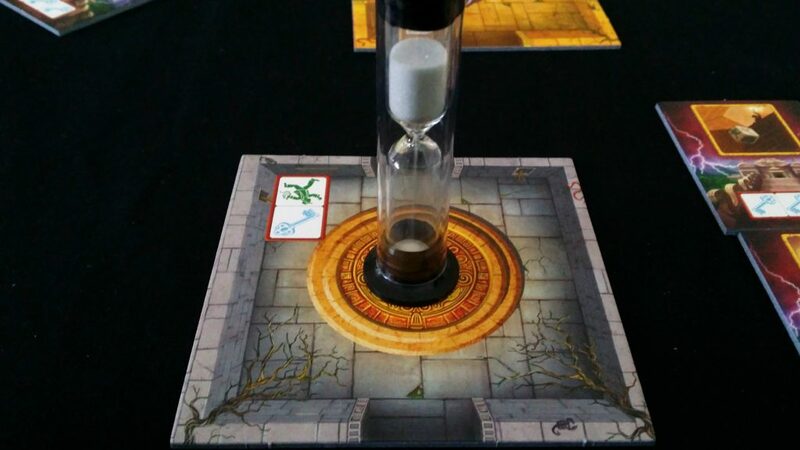 Escape: Curse of the Temple includes an hourglass for when audio cues are not appropriate – a thoughtful gesture. (Photo from Meeple Like Us). Brandon: It seems like most games can avoid big issues simply by using straightforward writing and staying away from audio cues. Brandon: As for games where lying, bluffing, or audible communication of strategy is involved, that is more of a genre/category issue and less of an individual game issue. Brandon: Now here’s where we get into the “persistently controversial” stuff. Emotional, socioeconomic, and intersectional issues. Brandon: What considerations are there when making emotionally accessible games? Michael: Board games are all about the social context, and to a certain extent, every game is going to be risky in this category – bad winners and bad losers transcend anything a designer can do. But there are some things that tend to exacerbate issues in this category – player elimination, ‘take that’ mechanics, the extent to which the players at a table can gang up on another player, winning-to-losing point differences, or being able to directly remove progress another player has been made. There are also a category of games (chess, Hive, and so on) that have a kind of “sheen” of intellectualism about them – it’s not true that the smartest person will win a game of chess but that’s often how society will interpret it. On a broader level, there are also issues of emotional accessibility that are associated with certain developmental conditions – a need to lie, a need to bluff, a need to read people at a table are examples of that kind of thing. Brandon: Would you say this is the hardest area to consider in regards to overall accessibility? Michael: It’s a toss-up between this and cognitive accessibility – the real problem here is that you have to design against a social context over which you have almost zero control, and it’s not even necessarily one where behavioural conditions even need to manifest for it to be a problem. We all know a bad winner or an obnoxious loser. And yet we all also know gracious winners and losers that can make even pointedly aggressive games lose any sting that goes with them. All you can really do is try to minimise the common catalysts for emotional upset – assuming that’s a goal you can meet within your game design. Brandon: For both emotional and cognitive accessibility, I recommend taking a really close look at your target audience again. “Mean” games can get away with early player elimination and take that. “Nice” games can’t. Know what your game is and know who it appeals to. Brandon: Make choices on purpose. Brandon: Oddly enough, this mindset of optimizing emotional and cognitive accessibility can be really good for diagnosing serious marketing issues early because they’re so subjective. In next week’s article, we’ll continue our conversation, focusing especially on the social aspects of board game accessibility. Often times, small tweaks and a general sense of awareness go a long way toward creating professional and polished board games. By exploring some of the ways we can make games more accessible, especially mentally and emotionally, we can create games that more people can play. More fun for everyone! Only have strategic synergy in your game when it makes sense for what you’re trying to do. Keep the flow of your game consistent unless changing the gameplay flow is part of the game. Keep wording as simple as possible. Use probability wisely, making it instinctive for players through visual cues if possible. Don’t rely on knowledge of trivia. Don’t require memory unless it’s part of your game. Don’t include complex conditional statements in your rules unless you have to. Don’t rely on general knowledge. Use tokens for arithmetic if possible. Minimize the need for communication (outside of table talk). Don’t rely on audio signals. Be aware that games with lying, bluffing, and audible communication may exclude subsets of people. Be careful with player elimination and take that. Keep losers and winners relatively close in points if you can. Don’t allow players to directly remove progress other players have made. Be aware of what kind of game you’re making.